Presence of a nicely and competently made website is meaningless, if it does not have visitors, since the goal of website placement in internet is to first of all advertise and in-detail familiarize the audience with the company’s or organization’s activity, which will help increase the flow of customers and the opportunity to acquire new partnership relations. WebMaker Studio offers quality promotion of your website, as a result of which not only its traffic will increase, but also the number of visits by exactly the target audience representatives. According to results of a research, the number of effective visits to websites through search in search systems 5-6 times exceeds the results of visits to websites though banner advertising. This happens, because the user enters your website as a result of a search in a search system, if the user purposefully searches for a good or information, which you can offer. There are very many advantages in promoting the website in search systems, as compared to its promotion with the help of, let’s say, banner advertising. Upon conclusion of the advertisement campaign, the traffic of the website abruptly cuts down, while indexation of the website through search systems continues in the whole process of website existence. 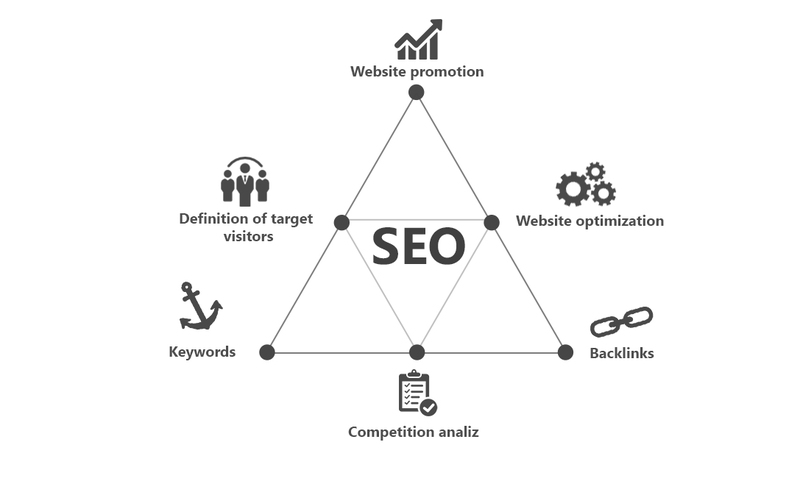 Optimization of the website structure is realized to make the website more readable by search systems. To that end, analysis of subject search inquiries is realized, as well as an analysis of the website to reveal and eliminate failures, which may hinder quality and quick process of website reading by search systems and, consequently, promotion of the website in search systems. Within the framework of structure optimization, research of the activity and development of competing websites is also carried out. Promotion in search systems includes registration of the website approximately in 3500 search catalogues, manual registration of the website in a few search systems, first of all in Yandex and Google, as well as placement of links for your website in various resources. As a result, your website’s entry to the list of top ten target search inquiries in search systems is secured, especially in the most popular search systems of Ru-net, such as Yandex and Google. Website support with continuous improvement of promotion results. No matter how high the results of website promotion turn out to be, one should not only preserve positions, but also continue improving rating in search systems. To that end, one needs to place more and more new subject text links, not simultaneously with following the work with already placed links. The process of website support implies analysis of its state and rating, including realization of necessary corrections, as well as continuation of website promotion in other search systems.